Value is one of the most important concepts within Lean thinking and one of the most valuable outcomes Lean provides. Value Analysis focuses on what adds value to business processes as perceived by the customer. A process that does not add value to the product or service should be redesigned or eliminated altogether. Problem solving and continuous improvement efforts often focus on those aspects of processes that add no value to the customer and are therefore wasteful. Value added activities – which increase the worth of a product or services from the customer’s perspective. Common examples include: machining a part or serving a customer at a call center. Essential non-value added activities (or unavoidable wastes), which add no value to a product or service and the customer is not willing to pay for them. However, they are necessary for the business due to the current settings of the process. Common examples include: purchasing, R&D and inspecting parts for quality defects. Non-value added activities, which add no value to the product or service, not required for business operational reasons, and must be eliminated immediately. Common examples include: rework an application form, delayed starts, and handling of materials between operations. The first step when analyzing the value of any process is to determine who the ultimate customer is. An ultimate customer is the end user of the product or service. It is important to understand your ultimate customers’ expectations clearly and know exactly what they are willing to pay for. You need also to actively listen to your customers and encourage them to send feedback on how well your product or service meets their needs for future process improvements. Researches has shown that value added activities are typically less than 10 percent of the total process lead time. This means that the work that the customer cares about is only 10 percent of the total work. For example, because patients are the ultimate customers in medical services, it is important to provide them with comprehensive and personalized health care. Patients instead often get stuck in processes that don’t add value to their primary care. They are often asked to fill out medical forms multiple times and wait too long to receive a consultation from their primary doctor. While the traditional approach to process improvement is to focus on reducing the time to perform the value added work (normally through capital investment), the Lean approach however focuses on eliminating the root causes of the 90 percent of the non-value added activities, which is much cheaper and more effective. Waste recording forms and waste logs. It is highly encouraged to regularly walk the process to look for opportunities to reduce waste and make improvements. A Waste Walk is used to quickly identify waste within an area or in a process. It is a practical approach that helps identifying value-added and non-value-added activities. It allows walkers to understanding how the process really works and helps them quickly identify continuous improvement opportunities. With your team, clearly describe the objective of conducting the waste walk. Select the process or area and define the boundaries. Prepare an observation form to collect the desired information. Get permission from the process owner or supervisor to conduct the walks and talk to the people there. Walk the flow of the process and look for each of the eight types of waste. Identify opportunities to eliminate waste at each process step. Prioritize improvement actions as appropriate. 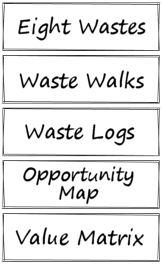 A Waste Recording Form can be used during waste walks to identify and record wasteful activities. It usually contains a place to classify the waste according to the eight wastes. It may also contain a place that encourages the team to propose priority areas for action. An Opportunity Process Map provides a visual picture of how the process works and where wasteful activities exist. 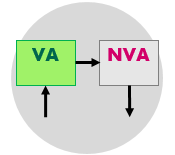 It is a type of process map with additional information about whether activities are value added or non-value added. Opportunities for improvement can then be identified by focusing on those process steps that add no value to the end customer and are considered wasteful. 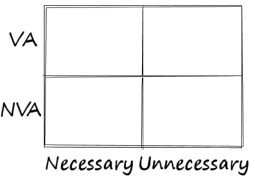 A Value Matrix can be used to help make correct decisions about wasteful and non-value added activities. For example, if the activity is unnecessary and adds no value to the product or service, then you need to eliminate it immediately. However, if the activity adds no value but is necessary for business operational reasons, then it can be reduced, integrated or simplified to optimize the process, and here is where Lean methods can be useful.